Announced in the 2016 federal budget, the Government of Canada’s Student Work Placement Program brings industry stakeholders together to create new work‑integrated learning (WIL) opportunities to better position students to secure employment in their field of study. 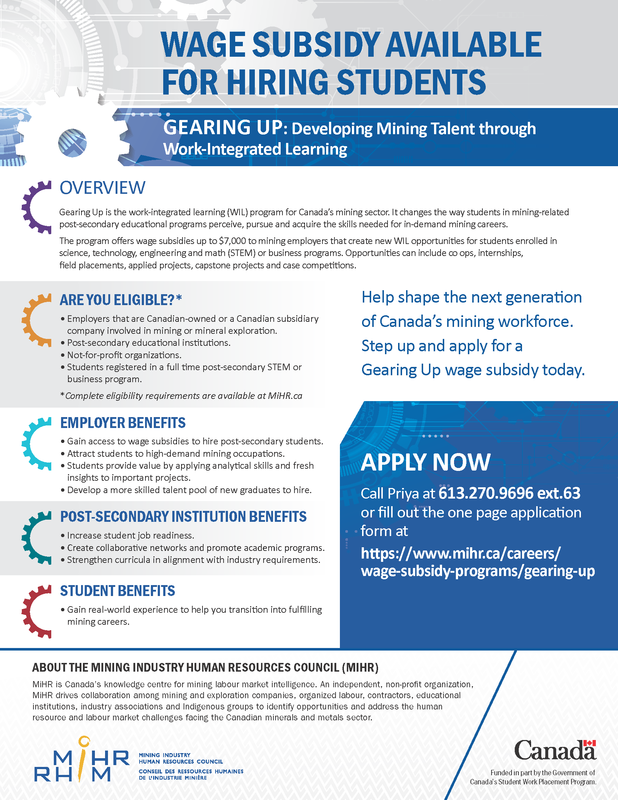 Gearing Up is the new WIL Program for Canada’s mining sector. Led by MiHR, Gearing Up will create 850 new WIL opportunities in mining over four years. Wage subsidies up to $7,000 will be available to employers who create new WIL opportunities such as co‑ops, internships, field placements, applied projects, capstone projects or case competitions. MiHR will work with a National Consortium made up of mining employers, service providers, industry associations and post-secondary institutions to implement program activities and inform how industry and education can work together more collaboratively through work-integrated learning.